As such, Joseph and his family believe it likely that any of the new software the district may have purchased in reaction to this incident is either targeted to other threats (unrelated to the existing vulnerabilities Joseph exploited) or should have already been in place as part of a baseline cybersecurity program for a responsible organization. They find district claims of costs related to rebooting school computer equipment to be evidence of the degree to which the district is reaching to substantiate their claims.The second irony is that one of the reasons the district offered for Joseph’s expulsion was to make an example of him to the wider school community. 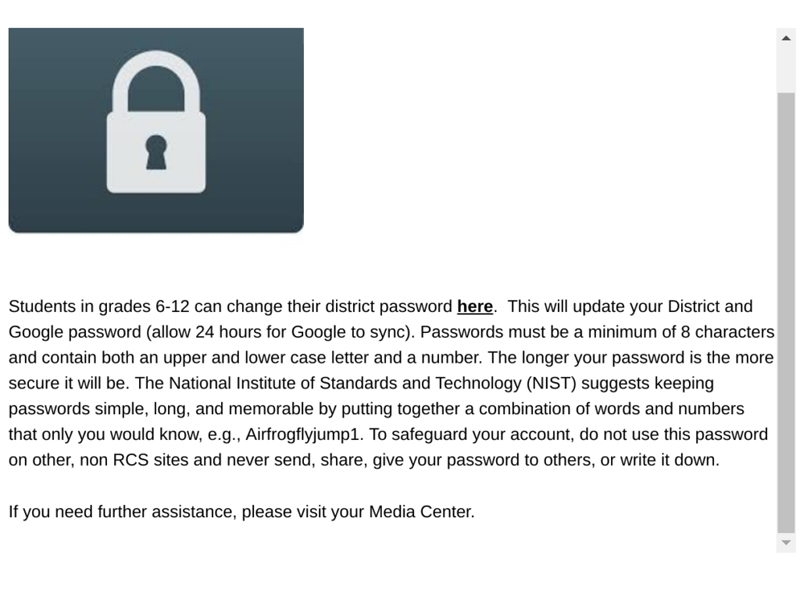 Yet, as of today, the only notice the district has made related to this incident was a cryptic suggestion posted on their website in early June that students have the ability to change their passwords.Source: Doug LevinThis post will be news to the school community (and–upon its publication–the incident will be added to the K-12 Cyber Incident Map).The District RespondsPrior to this story’s publication, I reached out to Rochester Community Schools for a response. In addition to giving them the opportunity to preview the article (as I had the Jones family), I also asked a handful of questions. A district spokesperson responded with the following information:Is the district pursuing criminal charges against any of the suspended or expelled students? Why or why not?“At Rochester Community Schools, we take the safety of our students and staff very seriously. Protecting our family is always our top priority. As such, we are prepared to prosecute to the fullest extent of the law anyone associated with dangerous and malicious activities, including those associated cybersecurity breaches.”Has the school community been informed of the incident(s)? If not, why not?“The Rochester Community School District works with local law enforcement to investigate all threats, including those associated with cybersecurity. When there is an ongoing investigation, we cannot publicly share details that could have a negative impact on the investigation.”What steps has the district taken to shore up the security of IT systems (based on what was learned from the district’s investigation of this incident)?“The Rochester Community School District uses various tactics to mitigate cybersecurity risks. Building awareness, encouraging employees and students to strengthen their passwords and keep them secure, and having restrictive permission policies are important steps in the process. Other tactics remain confidential to the organization so as to keep our network and student and staff information safe.”Being an impartial outsider to this situation, I can’t help but see this story as emblematic of the complexity surrounding the larger issue of “students hacking their schools.” Indeed, it is among the tamer of the dozens of such incidents I have documented since 2016.“If they think I am the only kid who is going to do stuff like this, I don’t think so. There are going to be kids coming who know as much—if not more—than me, and who knows if they have malicious intent.”Joseph JonesStories like this one will continue to occur in districts across the country if and until the issue of K-12 cybersecurity risk management commands more attention and resources from district leaders. Schools and their vendors must become more intentional in designing their systems for use by students who may not always behave in ways that are expected. And ultimately, school leaders and vendors should be held to account for not ensuring a minimum baseline of security controls. On its face, it seems hard to argue that any $100 million enterprise has in place adequate security controls when a couple of 12 year-olds can bypass them and trivially so.When a student does cross the line, schools should consider long and hard whether the most appropriate response is to expel the student and criminalize that behavior, versus viewing it as a unique teaching moment and a chance to shore up internal security practices. (Many organizations, in fact, pay good money for penetration testing services and/or offer bug bounties as part of their security compliance programs). Given the emphasis on STEM careers and the importance of computer science for the broader economy, it would seem that we’d want to embrace and channel the energies of those who show an interest and facility in computer operations…even when it may be in unanticipated ways.I don’t think there are easy answers, but I am certain that this story is far from unique. My hope in sharing it is to kick start a movement to find a common sense middle ground that leads to better school cybersecurity practices, while at the same time celebrating–yes, celebrating!–student ingenuity with and interest in computers. It is my sincere hope that this isn’t too much to ask.